Suspenseful romance with intriguing elements..
Lina, Lady Radbourne, thought being a countess would rescue her from poverty. Unfortunately, her young groom failed to plan for the future, and his drunken accident left her widowed and pregnant. Now Colonel Winstead Vaughan—Win—will inherit her late husband’s fortune…unless she gives birth to a boy. Win is her natural enemy, so why can’t she stop thinking about him? Win is stunned to learn he stands to inherit a vast fortune. He’s even more surprised to find himself falling for the beautiful, spirited Lady Radbourne, who is the one woman who stands in the way of a life he’d only imagined. When someone tries to poison Lady Radbourne, suspicion falls on Win. There’s a clever killer in their midst, and if Win doesn’t solve the mystery fast, Lina may perish. He needs to win her trust, but how can he prove it’s she he wants, and not the fortune? Everett crafts an intriguing tale of romance and suspense set against a deceivingly quaint Yorkshire estate. Lady Radbourne's young husband passes away while she is still with child and her future depends on whether it is a boy or a girl. If it's a girl, the estate passes on to Win Vaughn who never imagined he could achieve the title of Lord Radbourne. The title would be a boon to him due to his failing estate and also providing for family members. When Lady Radbourne and Win meet, they realize they are kindred spirits as both are after the same thing, which is to merely survive long enough to find out who can be out to harm the two potential Radbourne Estate owners. 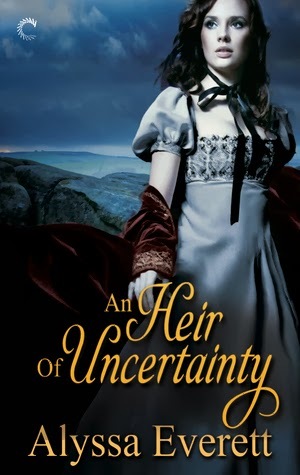 Both a character and plot driven story, there is a lot going on in this historical romance. With clever twists and misdirections, we can only guess at the villain's identity and the climax is done well. Speaking of climax, there is a large dose of sexual passion in one particular scene and just a few other “added for emphasis” romantic scenes, but the overall story was well done and kept me turning the pages. I wouldn't mind revisiting these very likable set of characters, especially Win's apparently ADHD brother.